Immediately after publishing my last article, I saw that Wat Tyler had posted on the scale of the debt again. There'll be no room for shilly-shallying—the cuts will have to be commensurate with the scale of the problem. And just in case anyone's forgotten that scale, a BOM correspondent in Singapore has recently sent the following chart produced by Citi Global Markets to advise their clients. So there is no room for hesitation. And no time either. The longer we leave it the worse it's going to get, as mounting debt interest compounds the problem. And for the those who say it would be better to call in the IMF and blame them, we invite you to watch the TV coverage of the Greek riots. The IMF is no easy option, and the IMF will give us little leeway to set our own priorities. Not to mention, of course, that such an action would screw confidence in the British economy for decades to come. Something needs to be done, and quickly. Any notion of increasing taxes surely assumes that the entity taxed actually has the resources to fund the extra tax demands. I'd be surprised if the effect of taxing, especially individuals and families, might simply break a large number of them, driving them into bankruptcy or similar, and actually reduce total tax revenues. Bear in mind that most people are effectively worse off than they used to be, with less disposable income, and probably only surviving because of the artificially low interest rates. However under Labour government spending increased by £200 bn above inflation so we know we could perfectly well reverse this (indeed this is UKIP policy). 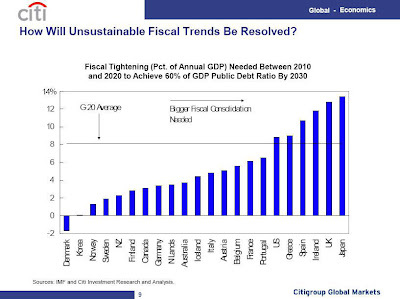 We also know that we could achieve Chinese levels of growth, which would double the economy in 7 years & thus, even on its own halve the ratio of debt to GNP. The problem is entirely that we have a political class so mired in fraud, luddism & pork barrelling that they have no intention of fixing the problem. They alone are the problem. That would require them doing something about it in power; they've set the bar low enough not to have to do anything and palm off the bomb to the next lot. Course a default would have an interesting effect too, namely pushing people into accepting to live within their means and on their ingenuity, just like previous generations of this island. How about a default on any lender who doesn't give us a 10 year interest freeze? After all, if someone lent money to a drunkard for them to buy more drink, they shouldn't be too upset if the drunkard can't pay them back. And in the future, make it standard Conservative/Libertarian/UKIP/any-party-that's-not-Labour policy that the moment they got into office, they would default on any loans lent to a Labour government. Might avoid this mess ever happening again. I did work out that government spending needs to freeze (in real terms) for about a decade in order to deliver us a surplus. And then it needs to remain frozen in order to pay off our debt. People thought Thatcher was bad, at least spending rose in real terms under her. Labour's decade of waste means that the next 4 governments are going to have to stick with inflation rises only in spending if we're to balance the books again. Bad news for anyone hoping to screw the state out of money - good news for us plebs who pay for government largese.